Due to a washout on September 22nd the Pecan Plantation Fly In is now rescheduled for Saturday November 3rd. at 10AM. Overnight camping on the field is available. There will also be a pancake breakfast on Sunday morning November 4th. 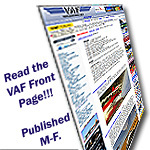 Hi Martin, the VAF Calendar shows an EAA983 fly-in. Is that the same one? I was going to suggest you post the Pecan Plantation information to the VAF Calendar, but it's not clear to me they are the same. "It should be added that the sublime beauty of the facture brings within the realm of discourse the substructure of critical thinking. " -using Doug's Art Critique jargon link and my birthday, I get this! Yes Don, that is one and the same. Chapter 983 is located here at Pecan Plantation but also has members who live elsewhere. The fly in is a joint effort between chapter members and airpark community residents. Is this an appropriate event for a non-pilot to see a collection of RV and experimental aircraft up close in the DFW area? I’m not associated with the group putting on this event, but I have attended several times. There is usually a fairly good turn out with a good variety of aircraft. Seems typically to have a dozen or so RV’s of various types. I'm going to try to attend....I'm interested in an RV7 and would love to speak with current RV owners. Hopefully my schedule will work out.